I lay prone on the surface of the water and took a final breath. I bent at the waist, pointing my head downwards, lifted my legs into the air and slid into the water. I started finning downwards – hard – 5m, 10m, but I’m no Tanya Streeter! I righted myself and looked up; I could just make out two colourful pairs of snorkeller’s fins 4 to 5m apart. Somewhere in between these was the creature I was trying to photograph – a whale shark. I started swimming in a direction I thought would intersect the path of the still invisible animal, all the while watching the snorkellers approach. As the unmistakable outline of the shark started to form, I swam towards it, positioned my camera between it and me and stared at the camera’s display. I waited as the shark grew larger and larger, and adjusted my position in the water to try and exclude the snorkellers behind it. When it filled the display, I pressed the shutter release and saw the flash of light from my strobe light up the front of the animal. My camera displayed the image it had just taken – “Got it!”, I thought. I removed the camera from in front of my mask revealing the massive shark right in front of me (warning – objects in a wide angle lens are closer then they appear!!). I frantically finned backwards. The shark eyed me with apparent annoyance, turned on its side and performed a gentle banked turn around me. I watched in awe, silently reprimanding myself for clumsily invading its space. 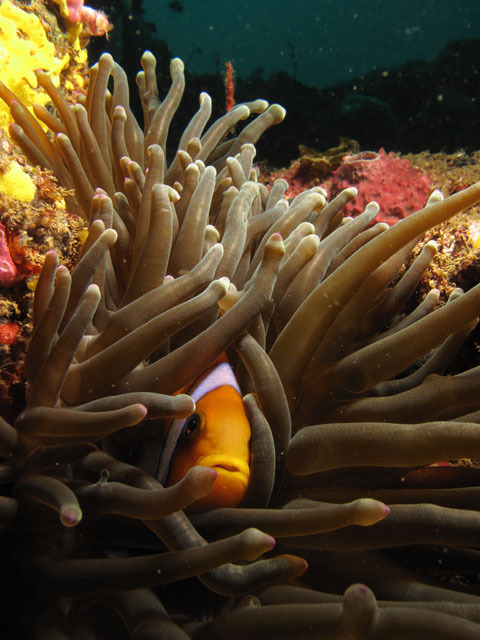 Djibouti Liveaboard - Book now & pay later. I have been recreational scuba diving for 25 years now, and more recently have taken up underwater photography. In my time diving, I have been privileged enough to see my fair share of the world’s sharks in their natural habitats: mighty basking sharks in the waters around the south of my home diving area, the beautiful Isle of Man (an island off Britain in the Irish Sea); hammerhead sharks on sea mounts in the Sea of Cortez; oceanic white tip sharks patrolling the moorings of the live-aboard dive boats off Daedalus reef in the Egyptian Red Sea. But in all that time, I had never sighted the largest shark of them all – the majestic, and not at all dangerous, whale shark. So I decided it was high time I actively sought them out. But where should I go? The world’s hot-spots for whale shark sightings include the Galapagos Islands off Ecuador and Ningaloo Reef off Western Australia, but neither was achievable in the week I had available to me nor, in reality, within my budget! A quick search found me another option - Djibouti. Djibouti! Where’s that? Djibouti is a small former French territory of less than 1 million people that lies on the horn of Africa just below the Red Sea. It is bordered to the north by Eritrea, to the west and south by Ethiopia and to the south-east by Somalia. It hardly sounded like the ideal holiday destination. But I put my fears of Somali pirates and snow induced travel disruption aside and, at Heathrow, I found myself sitting in the middle seat of a row of three on an Ethiopian Airlines Boeing 767. The seat to my right was occupied, and as a stout chap with a large, handlebar moustache walked down the aisle, I thought “no, no … oh dear” as he sat down to my left. Now feeling a little hemmed-in, as boarding was completed I moved forward to an empty aisle seat in the row in front of me. I turned back and apologised to the hirsute gentleman, who introduced himself as Michael, an Australian resident of London who, as it happened, was on the same trip as me. Turned out his moustache was due to his Movember fund-raising efforts (it disappeared very soon after), and his rotund appearance was due in the main to the huge number of camera lenses secreted around his body in an attempt to keep the cost of his already excessive baggage under some kind of control. Our conversation soon turned to nudibranchs (sea slugs) and underwater photography, and I began to feel that the trip was underway even prior to us taking off. Things further improved during the change of aircraft at Addis Ababa airport where we were joined in a coffee bar by Craig from London and Bob from Chesterfield. Again, discussions turned to the relative merits of the various far-flung diving destinations we’d visited, as well as the different underwater camera configurations we were all carrying. It was turning into an underwater photography geek-fest, and I was starting to feel perfectly at home. We arrived at Djibouti airport, stood in a long queue to have our passports checked, then stood in another long queue to be interviewed 1-on-1 by an official just for the privilege of purchasing an entry visa. I then decided to “pay a visit”, but the state of the facilities dissuaded me from performing – I would just have to wait. We were transported by a dilapidated but extremely colourful minibus past the airport’s rather ancient and neglected looking Twin-Beech gate-guard to Djibouti’s Fishing Port where our boat for the week, the MY Deli, was moored. 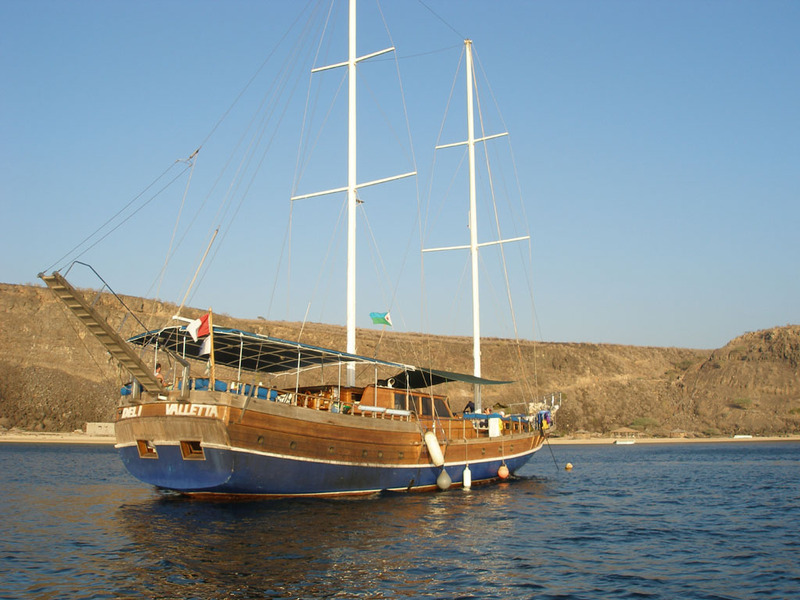 The Deli, a 26m, twin-masted, open-bridged wooden hulled boat, although no 5-star Red Sea live-aboard, was certainly comfortable and practical. Once on board, the group of six Brits, two Antipodeans, four French and a German called Bernard, gathered together for welcome drinks and were and assigned cabins – I was sharing with Craig. The Deli’s captain and our dive guide for the week, Vicente, introduced himself. Somehow his balding pate, straggly hair, stare-y eyes and almost stereotypically French mannerisms made me think of him as a corsair, a French pirate, which seemed to me to perfectly suit the situation. The hassle of the travel and the airports was quickly receding into distant memory, aided by the welcome drinks and eager anticipation of what was to come. Other than the promise of whale sharks, Djibouti seems to have little to offer, at least as a tourist destination. The country is extremely poor: two-thirds of the population live in Djibouti city, where the French influence can be clearly seen in the architecture and occasional passing Foreign Legionnaire; the street markets, however, have a much more traditional African feel to them. Outside of the city, the countryside seems to consist of orange sand, black rocks and wiry bushes. Rainfall is scant, the majority usually falling in December. Nomadic people scratch a living from the barren landscape by herding goats, and goat skin tents can even be seen on the black volcanic rock, defying belief that anyone could actually survive in such an apparently hostile landscape. The country’s most important economic asset seems to be its location – its port and roadways providing an artery from Djibouti city’s container terminal through to Ethiopia to the west. Its port and airport seem also to serve as havens for American military activity, including providing a landing strip for a bizarre-looking “Reaper” unmanned combat aircraft. Djibouti sits on the join between the African and the Arabian tectonic plates - the volcanic rock, salt lakes and hot springs offering evidence of ongoing geological upheaval. The Afar Depression, a continuation of Africa’s Eastern Rift Valley, passes through the Tadjoura region of Djibouti, and here can be found the striking salt lake, Lac Assal, at 155m below sea level, the lowest point in Africa. The Depression meets the sea at the Goubbet al Kharab or Devil’s Cauldron (not, as us sceptics would have it, named by those trying to market diving holidays, but for its harsh environment). Indeed, one of the planned dives was to be in the Goubbet at La Faille – the crack between the two tectonic plates! Through the mouth of the Goubbet, a tidal narrows, is the Gulf of Tadjoura, the branch of the Gulf of Aden which cuts into Djibouti, and it was there that we were heading. Despite being keen on finding our first whale sharks, our first two dives were on the reef at Ras Eiro on the southern shore of the Gulf of Tadjoura; they were pleasant, if unspectacular. The orange and pink anthias that dominate the shallow corals in the Red Sea were notable only by their absence. The coral was, however, in excellent condition. We had each been assigned a single dive buddy - except for me who was teamed up with both Craig and Bernard - and each buddy team was assigned to one of a pair of skiffs. Ours was the rather blandly named “Annexe 1” (“it’s a French thing”, said Vicente) which we were to use for the whole week. After these first two dives, we at last sighted our first whale shark! It was, however, Chinese, 10 cm long and plastic: Vicente used it when briefing us on how to treat the whale sharks during our upcoming snorkelling sessions with them. “Stay 2m away; 4m around the head and tail. If they feel threatened, they will dive and you will lose sight of them”. We boarded the skiffs, left the Deli at her moorings and headed off down the coast. As for my previous experiences when searching for basking sharks, we were looking for fins on the surface, but whereas with basking sharks you can see the huge dorsal as well as the tail fin, with whale sharks only the smaller tail fin is visible. After an hour or so we saw Annexe 2’s snorkellers roll into the water and heard the cry of “requin-baleine” from Abdou, our coxswain. We raced over and, excitement mounting, followed them into the pleasantly warm 28o water. By the time I got my bearings, the shark had been spooked by all the activity and was already diving; I took a deep breath and followed the distinctive outline and white spotted back as far down as I could, not as far I would have liked, but at least I had my first sighting and a rather faint, but readily identifiable whale shark image on my camera. Yes!!! After another dive, we had a second chance. This time, perhaps because we were all a little less exuberant, the shark wasn’t disturbed by our arrival, and I was able to swim alongside it as it cruised just below the surface for a good half-hour or so. By finning steadily, I could maintain a position alongside its flank and watch it as it swam effortlessly along the reef edge. I took some photos from this position, and from behind, but I found it almost impossible to get in front of the shark; it didn’t seem to want to be overtaken. So I stopped finning, called Abdou and clambered back aboard Annexe 1. I asked him to drop me 20m or so in front of the shark and its trailing snorkellers, and I got a wonderful shot of them all as they came past me. A fantastic result for our first day spent with these truly magnificent creatures. For the next couple of days we continued the pattern of alternating scenic dives with whale shark spotting snorkelling sessions, and were lucky enough to experience many excellent sightings. All the sharks in the Gulf of Tadjoura are juveniles, a mere 5-6m long rather than the 10 m plus of a fully grown adult. In the water, however, they are still hugely imposing. Viewed from behind, they appear quite rectangular from the mouth back to the pectoral fins, then taper away into the huge tail. From above, they are dark with that extremely distinctive white-spotted pattern; from below, they are much paler – in fact surprisingly well camouflaged. They have oval mouths which to me seem small in comparison to the yawning gape of the more familiar basking shark. They are not at all threatening animals to be close to in the water, but that said the tail is best avoided! Although it was possible to keep up with them, it did require constant finning, and I noticed that some of those in the group who weren’t carrying cameras had adopted a part front-crawl, part finning technique in order to ease the effort on their legs. The sharks certainly seemed less skittish than their ‘basking’ cousins, quite happily allowing a half dozen or so snorkellers to accompany them. Very occasionally, a shark would slow down and adopt a more vertical position in the water: “il mange, il mange” came the cry from Abdou. We would watch as the shark took huge gulps of the plankton rich water. I took advantage of one of these opportunities to get ahead of a shark, turn in front of it and get a fabulous view straight back into its face! Late one evening, aboard the Deli, we were in for a further treat. 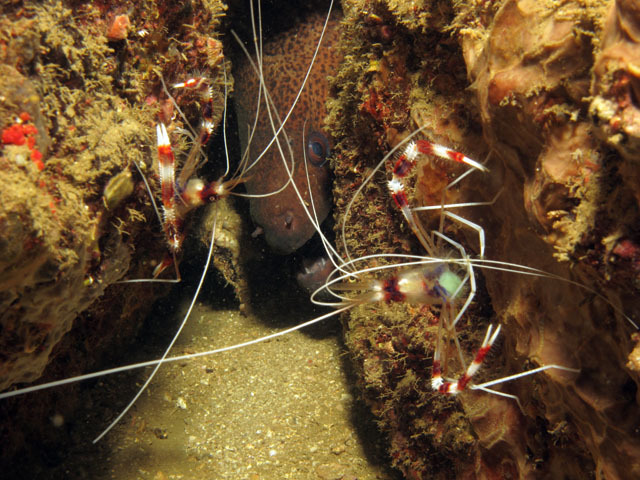 Vicente had installed powerful fluorescent lights on the starboard side of the vessel, and at night this light attracted plankton, which in turn attracted a plethora of fish and, oddly, hoards of red swimming crabs. On one evening, it also brought in a pair of whale sharks. For more than an hour we watched as the sharks cruised in from the black water, went vertical next to the Deli’s hull and, amid the flashes of our cameras, took huge mouthfuls of the plankton rich water. Occasionally, they would take in a swimming crab or two, which they then immediately spat out with apparent disdain. Michael, the Australian, grabbed his camera, donned his snorkelling gear and wedged himself between the Deli and the back of Annexe 2. He claimed that the photos of these whale sharks feeding at night were worth all the pain and bruises to his exposed flesh caused by the nipping swimming crabs! I wasn’t as convinced, and enjoyed the spectacle from the comfort of the boat with camera in one hand and a large glass of Laphroaig whisky in the other. As our adventure continued, my collection of whale shark photos continued to grow. But I still had not got the photo of a whale shark that I’d envisaged and really wanted, that is one taken from in front and beneath. So on our final day of snorkelling sessions, I adopted a different technique. I asked Abdou to motor 50 or so metres ahead of a shark and its accompanying snorkellers, and dropped in the water. I then watched the snorkellers on the surface (I could see neither them nor the shark underwater) until they got about 20m or so away, took a deep breath and headed downwards, righting myself only when I thought I was sufficiently deep to swim upwards towards the shark. I then turned and looked for the snorkellers, whose colourful fins were much more visible than the shark, and then tried to time my ascent to pass at the ideal distance in front of the shark. Occasionally, I didn’t even see the shark, and more than once I ended up right underneath it, trying desperately to hang onto my breath long enough to be able to ascend unimpeded by either shark or snorkeller. But on a couple of occasions I got it right, and, to my huge delight, managed to get the exact shot I was looking for. But the whale shark sightings extended beyond the snorkelling sessions. On one of the night dives, I was just about to leave the surface when the cry of “requin-baleine” came up from the crew. I stuck my head into the water just in time to glimpse the ghostly silhouette of a shark pass through the black water in front and below me. And on another of the dives on the reef, I heard the metallic jangling of Vicente’s quirky but effective signalling device. I looked around to see a large hump-head wrasse in the distance; “That must be what he’s seen”, I thought to myself. I was wrong! The guttural roar of Vicente’s voice came from behind me, and I turned to see him swimming down the reef next to a whale shark. I checked my depth gauge, 15m, and with my air, time and deco all OK, I took off after it. Craig and Bernard followed, and we followed the shark for a minute or so along the reef before it turned and cruised off into deeper water. As we re-traced our steps back along the reef at a more sedentary pace, all three of us were elated. But like all good things, the sessions with the whale sharks came to an end. We travelled further west to the end of the Gulf of Tadjoura and into the Goubbet al Kharab itself. In my view, the dive in La Faille, the crack between the two tectonic plates, was, despite the extraordinary setting, a bit of a let-down. However dives at La Vierge Rouge, with huge formations of coral perched on its steep drop offs, and at Sec-de-la-Passe just outside the mouth of the Goubbet, with its strong currents and teeming fish life, were both excellent. That evening Vicente showed the episode of the BBC’s Rift Valley series that featured La Faille. And in the “making of” sequence at the end – there he was! He had acted as guide and support diver to the film-makers. He related a tale of how he had had to rescue the remote vehicle they had used to film in the crack after it had got stuck at 45m, and was quite disparaging about the “poetic license” used by the programme editors which gave the distinct impression that filming done at 90m was performed in the crack, when in fact it only reaches a half that depth. We finished the trip by heading to the north coast of the Gulf and, after a dive, a visit to the town of Tadjoura, where the poor living conditions of the local people served as a stark reminder of how lucky I was to be able to undertake such a lavish venture. 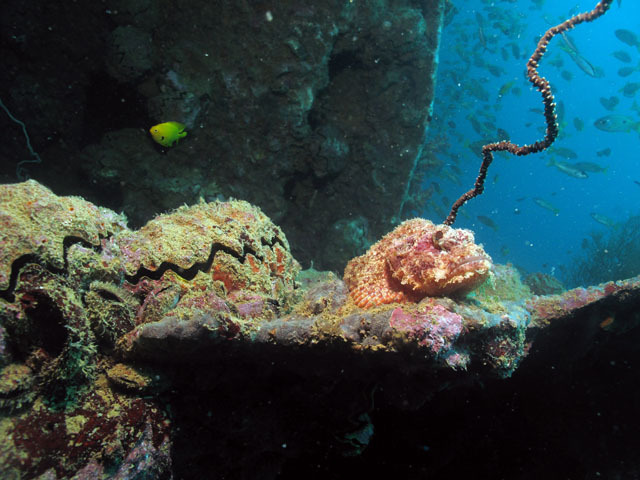 Finally, we headed back towards Djibouti town, stopping off at a group of islands in the middle of the Gulf for another excellent dive, this time on the wreck of a cargo vessel called the “Orchard Reefer”. It should be noted that in all the time we spent in the Gulf of Tadjoura, not one shark of any other species was seen by any of the divers. “The whale sharks, they are lucky.” said Vicente, “They are protected now, but even so, their fins wither when they are dried. All the other sharks here have been taken by the finners.” It was a sobering reminder as to the threat imposed on most of the world’s shark species by the wretched industry that feeds the appetite of ignorant diners in certain countries for shark’s-fin soup. In contrast to the accommodation on board Deli, our final night was spent in the rather luxurious Sheraton Hotel in Djibouti city. Enjoying a post-dinner beer (or three) in one of the town’s bars, I reflected on the trip. The diving, although not spectacular, had been better than I’d expected, but the whale shark sightings, the main aim for my trip, had far exceeded anything I had hoped for. Would I repeat the trip? Unlikely, I thought, as sighting a whale shark has now been well and truly ticked off my “list of things to do before I die”. Would I recommend the trip? To anyone who is looking to fulfil their dreams of swimming with whale sharks, or even to a seasoned diver just looking to do something a little different, absolutely! Everyone on board the Deli that week had a fantastic, and privileged, time. copyright Tim Nicholson. All rights reserved. The best time to see whale sharks in Djibouti is from November to January, although you may also see them in October and February. The water is warm, averaging a pleasant 26 oC at its coldest in February and reaching around 30 oC during the summer months of May to September. The diving is by liveaboard: as well as the Deli two others operate in Djibouti in the winter months: the Lucy and the Elegante. Please add your comments on diving Djibouti, or anything else on this site.